Gold Buyers of America address, phone, website, and more. 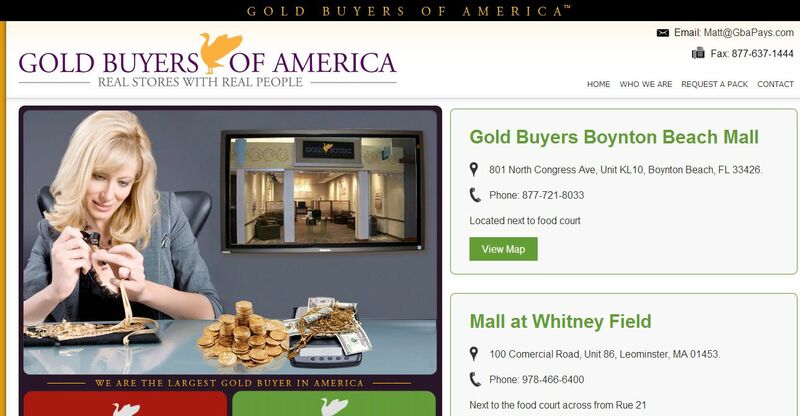 At Gold Buyers of America, we believe that our customer’s needs are of the utmost importance. Our team is committed to meeting those needs and as a result, a high percentage of our business is from repeat customers and referrals. We want you to be comfortable with the process as well as the price. Because at Gold Buyers of America, we understand that you aren’t just selling pieces of metal, but pieces of memories. Gold Buyers of America offers many ways for you to sell your gold, silver, and platinum items and our goal is to make selling your unwanted jewelry a comfortable and safe process.